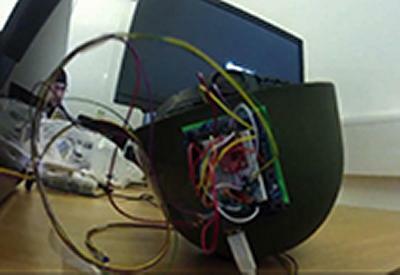 Students from the University of Southampton have won a national competition thanks to a revolutionary helmet they designed for use by soldiers on the battlefield. The student team won the Project Arduino competition organised by Thales, a leading engineering and technology company. The contest required the students to build a piece of equipment, using the Thales Arduino open-source electronic microprocessor platform, which tied in with the Thales business areas – transport, aerospace, defence and security. The students designed an innovative helmet that monitors soldiers' heartbeat and temperature along with other factors such as their body position. Students from Electronics and Computer Science worked on the microprocessing circuits, while third-year MEng Mechanical Engineering student Erik Kovalan used the University's 3D printing facilities to create a robust casing for the technology. The team had two weeks to work on their design and produce a video showcasing their invention. “We were asked to come up with an idea that reflected Thales work. The company is a big defence contractor so we thought a multi-purpose helmet would be worth developing,” says Erik. Teams from six universities (Brunel, Manchester, Surrey, Sussex and University College London) took up the challenge and after some hard-fought technological battles that whittled the six campus winners down to three, the winner was chosen by a public vote. Watch a video about the Team Helmet project here.